It’s been a while since I’ve visited a taqueria so I figured I better start working on them. We have quite a few in Roseville. Today on my way home from work I stopped at Taqueria Maria, located on the corner of Cirby and Riverside in a little strip behind the gas station. It’s a pretty small little place with less than 10 tables. I started to go over the good sized menu right away and was greeted by a very friendly cashier who told me to take my time as she prepared an order to go. They have all the usual stuff including my favorite, the carnitas plate. They also had a 2nd menu on the wall to the right with a dozen or so items with photos (which I completely forgot to get a picture of). On that menu I only recognized the Chile Colorado, which I’ve had at Mas. They also seemed to have more seafood options than I recall other taquerias I’ve been to having. I went ahead and ordered the carnitas plate which comes with rice, beans, guacamole, sour cream and pico de gallo salsa. For my beverage I chose bottle of Mexican Coke, hard to pass those up when I see them :). After paying I went around to the front where the salsa bar is located and grabbed some chips and the darker hot salsa that I enjoy. The chips were pretty boring. 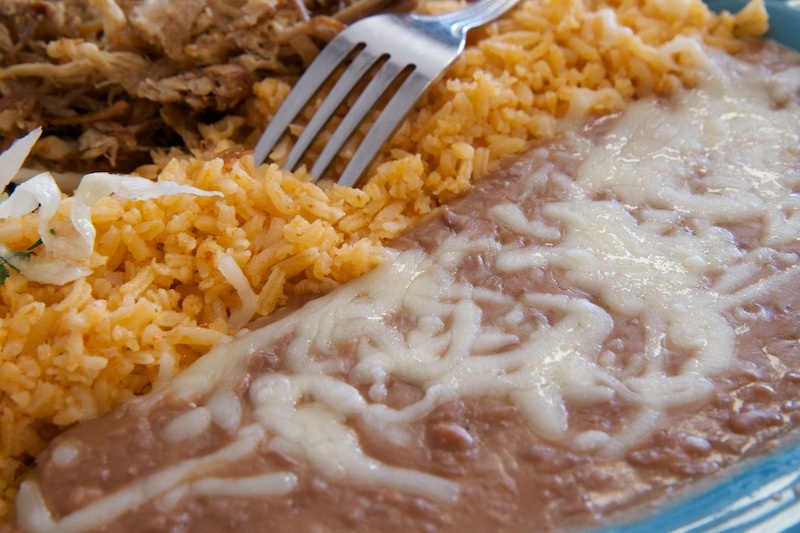 Without salsa, they wouldn’t really be worth eating. As an edible salsa delivery medium however, they did the job. The salsa was slightly hotter than I was expecting and it had good flavor. I ended up getting some more chips before I left to finish it off. I noticed after I sat down that I had missed their horchata machine. I only regretted that for a moment since the Coke was nicely chilled and quite refreshing. 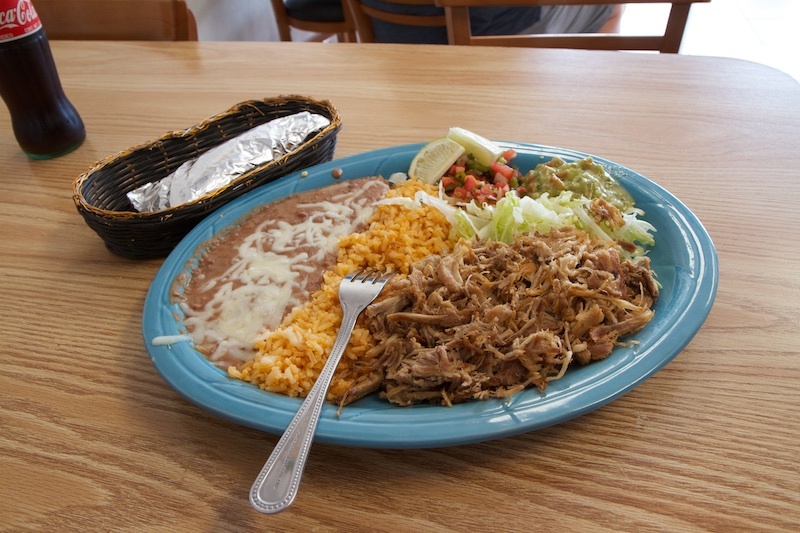 My carnitas plate was brought out to me quickly, just over 5 minutes or so after ordering. With it was a little basket which contained super hot and steaming corn tortillas. I noticed pretty quickly that the sour cream was absent. The guacamole was a bit on the runny side and was a little bland. The rice and beans were pretty standard. I mixed those together with the small amount of lettuce and salsa. 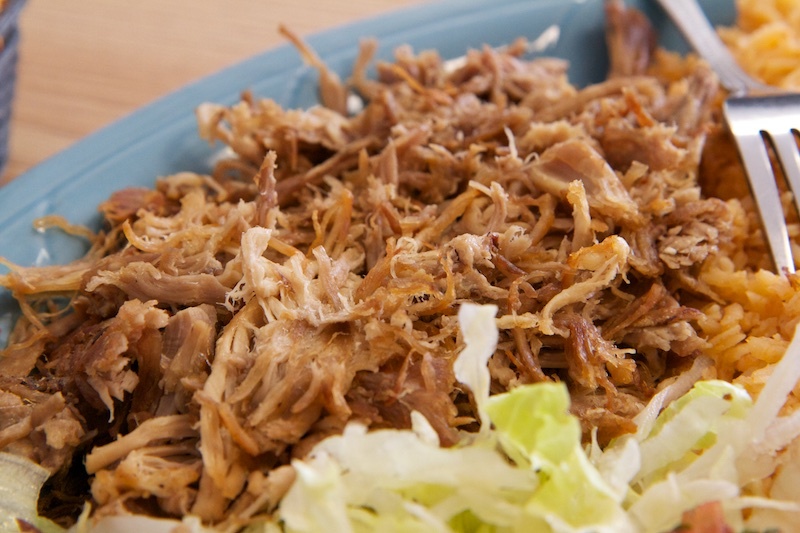 The carnitas was finely shredded and was quite dry and tough. I hit a very small little section of juicy, tender carnitas about halfway through that was fantastic and showed me what could have been. Unfortunately the plate was a total disappointment overall. I’m feeling a bit of Déjà vu on this one. Like Yoko Sushi we have a lot of good taquerias and I’m not sure I can expect to return to Taqueria Maria knowing that I can get much better carnitas elsewhere. The only standouts here were the salsa, Coke and friendly service, but all these things can also be found at the competing taquerias. Next Post Tomorrow: Downtown Mobile Food Event!